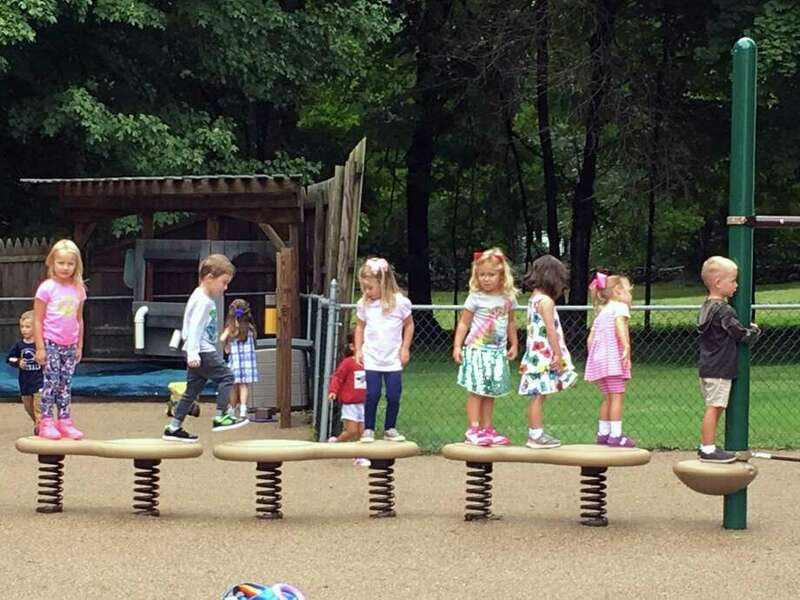 Children climb on the new playground at the Methodist Family Center Preschool in Darien. The Rev. Thomas Kim led the ribbon-cutting celebration on Sept. 9 with a blessing of the playground and songs of celebration. On Sept. 9, the Methodist Family Center Preschool held a ribbon cutting ceremony for their new playground. The Rev. Thomas Kim of the Darien United Methodist Church led the celebration with a blessing of the playground and songs of celebration. “Play is critical to developing happy, healthy and resilient kids. In a time when children are spending less and less time outdoors, we are thrilled to provide a safe and fun place for our students to explore and play,” said Laurie Andersen, MFCP director. The vision for the new playground space was to create a natural setting where children can climb, dig, balance, explore and enjoy the outdoors. The equipment is geared toward children ages 2 to 5 years old with challenging options like a tight rope, monkey bars and balance beams for the older kids. A new poured-in-place solid surface was also installed to increase safety and provide a clean aesthetic. The YMCA is hosting a coat donation and open house on Sept. 22 from 1o to 4 p.m. The community is invited to donate new or genty used winter coats and find out more about the Adventure Guides program. Adventure Guides is a program that brings fathers and their children together in a variety of activities to foster friendship and service. Held during the school year, children are organized into tribes based on school affiliation. Tribes are run by fathers and host various events and participate in town-wide community service activities. For info about Adventure Guides, visit darien-ymca.org/adventure-guides/ or contact: April Greene at 203-655-8228 ext. 1309. A check on behalf of the John and Ethel Kashulon Foundation was recently presented by President Martin P. McLaughlin Sr. to Amy Bell, executive director of the Darien Community Association. The donation will support the DCA’s college scholarship awards to Darien High School graduates. The Kashulon Foundation mission is to improve people’s lives through the funding of programs whose mission and projects align with its three unified goals of enhancing educational, children’s and cultural opportunities. The DCA is located at 274 Middlesex Road in Darien. The following Darien residents enrolled at Colby College in Maine for the 2018-19 school year: Nicholas F. Byrne, Emilia A. Callery, Sally Cassidy, Abigail S. Conway, Hayden H. Edwards, Lauren M. Jennings, Ellery S. Kenyon and Oliver J. Steeves. Before classes began Sept. 5, students took part in a weeklong orientation that included an introduction to academic and intellectual life at Colby, participation in an outdoor education trip, and an address by the Crawford Family Professor of Religion Nikky-Guninder Singh at Colby’s 201st convocation. Take a lantern-lit tour through the old Mill Hill graveyard and hear tales based on real events from Norwalk’s hidden past at the Norwalk Historical Society’s eighth annual A Haunting at Mill Hill. Tours will take place Oct. 12-20, on Fridays at 7;30 and 9 p.m., and Saturdays at 6, 7:30 and 9 p.m. Each tour lasts approximately one hour. Space is limited; purchase tickets online at MillHillHaunt.com. Not recommended for children under eight years old. Mill Hill Historic Park is located at 2 East Wall St. in Norwalk. CT 06851. Follow signs to parking across the street. No parking onsite. Stories of death, murder, insanity and destruction await visitors, incluidng tales of a knife-wielding suicide victim from South Norwalk and an insane pyromaniac from Silvermine. At the end of the tour, encounter the spirits in the Historic Haunted Maze, created by local haunted house and special effects experts George Holomakoff and Greg Kling. Ticket sales at www.millhillhaunt.com. Early bird tickets available through Oct. 11 at $18 for adults and $15 for children ages 8-12. Tickets purchased after Oct. 11 or at the door (if available) are $20 for adults, and $18 for children ages 8-12 .The net proceeds support the Norwalk Historical Society’s education programs and cultural exhibits. For information visit www.millhillhaunt.com, www.norwalkhistoricalsociety.org, email info@norwalkhistoricalsociety.org , or call 203-846-0525. Darien’s 10th annual Feed My Starving Children MobilePac Event, hosted by the churches of Darien, offers local volunteers a chance to provide hope and life to starving children. Each day approximately 6,200 children die from starvation all around the world. Over 1,000 volunteers will be packing meals, with a goal to pack over 200,000 meals throughout the weekend of Oct. 20-21. The event will take place from 10 a.m. to 8;30 p.m. on Saturday, and from 9 a.m. to 3:30 p.m. on Sunday at Middlesex Middle School, 204 Hollow Tree Ridge Road.